Our Tomorrow EOPM is provided for you and if you think it can be optimized such as adding the dynamics etc, welcome to provide us with the more perfect Our Tomorrow EOP and EOPM! 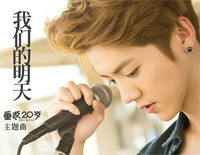 Our Tomorrow is used as the theme song for the series Miss Granny and was sung by Lu Han. Lu Han, born April 20, 1990, is a Chinese singer best known as a member of the South Korean-Chinese boy band EXO, and its subgroup EXO-M.